Excerpts from A Summer Journal. My cabin sits on a small plateau in the Eastern Sierra of California, above the west end of June Lake, in the upper watershed of the Mono Basin. It is a small wooden cabin, built in the early 1940s. It is inaccessible in winter, but open from late spring until mid fall. Looking northeast, one sees the lake, then the terminal moraines, the two highest Mono Craters, and sky. The first time I saw the cabin, I didn’t even go inside. I just sat down on the front porch, looked at the landscape, and thought, a view of my own. By now I have spent more than twenty long summers there and have always vaguely considered painting that scene. Finally, I got around to doing just that—over and over and over at different times of day or night, changing angles of sunlight according to season, snow or rain or wind or fire. This is a certain kind of traveling. 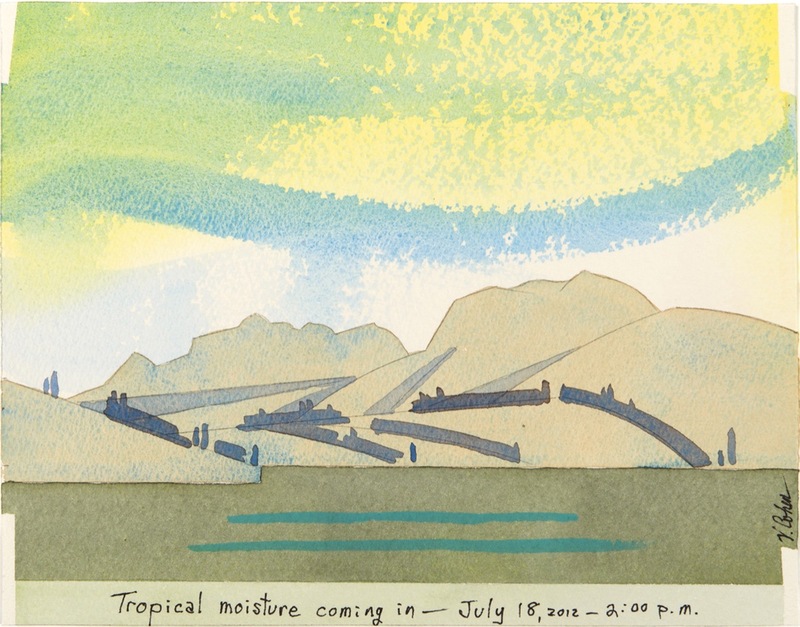 These six paintings are taken from the book Mono Craters and June Lake: A Summer Journal, containing twenty-six watercolors originally painted on Arches 300-pound rough rag paper. Each original is 7 by 9 inches. Click an image below to see a larger version.